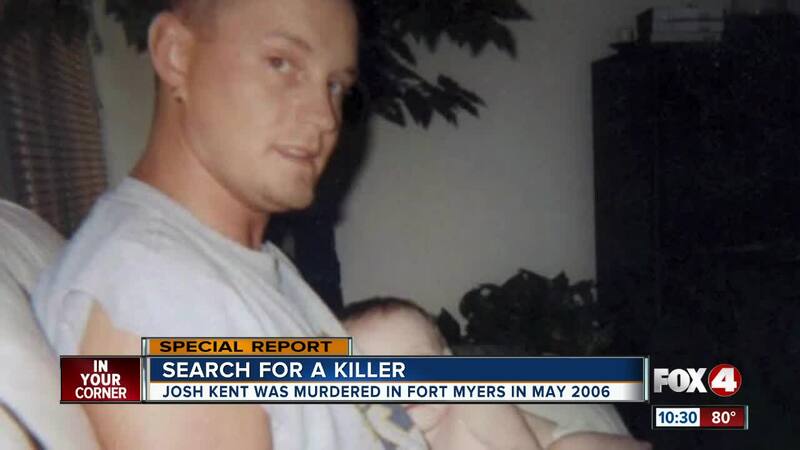 12 years after a mysterious murder of a young father in Fort Myers, the case remains unsolved. Josh Kent was killed at the age of 31. He left behind a 4-year-old son who is now 16 years-old. "He was good to him," says Josh's mom, Debbie Harrison. "He loved him and he would've done anything for that kid," she adds. Debbie is still praying the killer will be caught. "You can't just give up hope. I pray for justice," says Debbie, who now lives with her husband, Tom, in Sarasota. Her son was killed outside of a Fort Myers apartment complex on the weekend before Mother's Day in 2006. Debbie says she remembers getting that horrific first phone call on the morning of May 7th of that year. "I was told my car had been involved in a homicide," says Debbie. But she was not initially told who had been killed. "I would have given anything if it had been somebody else in that car instead of my son," says Debbie. Police later confirmed her son Josh had been shot while sitting in her car - which he had borrowed the night before. "You don't get over this." "I don't care what anyone says. If they say they're over the murder of their child, then they're lying." Debbie and Tom shared what they remember about the case with 4 In Your Corner with the hope it will lead to more tips. Tom remembers two strange visitors to their home in Cape Coral the day before Josh was killed. "The doorbell rang, and I answered the door," says Tom Harrison. "It was two scruffy looking white guys," he says. "One had long blonde curly hair and the other had brown straggly brown hair," Tom adds. Tom says they said they wanted to see Josh over money they claimed he owed them. Tom says he vaguely recalls the amount the mentioned - about $60. Tom told them Josh wasn't there because he was at work at a resort on Upper Captiva (Also know as North Captiva) Island. But the men insisted he was. "And I said what you need to get off my property or I'll call the police," says Tom. He says they left and then he and Debbie went out for the night in Charlotte County. They say Josh came to their Cape Coral home that night while they were gone. Debbie remembers Josh called her to ask to borrow her car that night. And she says their phone conversation ended the way it always did. "He said loved me," says Debbie. "He always said, 'I love you mom' whenever he talked to me," she adds. 4 In Your Corner asked Fort Myers Police Sgt. Jay Rodriguez what he could tell us about the case. "Kent was killed in an apparent drug deal," writes Sgt. Rodriguez. "Kent was seated in the driver's seat of his vehicle and another vehicle pulled up next to him." "Kent suffered a gunshot wound," writes. Sgt. Rodriguez who adds it happened in the 2700 block of Royal Palm Avenue. He writes, "The name of the (apartment) building has changed over the years." Tom and Debbie confirm police told them they suspect he may have been involved in a drug deal that night. "Even if he was, he didn't deserve to be shot," says Tom. "It doesn't matter what he was there for, in my opinion," says Debbie. "Somebody took somebody's life. That person needs to be held accountable," she adds. Debbie and Tom say it's difficult living with so many answered questions. They wonder about a woman Josh had met around that time. They say she worked at the Publix on Santa Barbara Boulevard near Pine Island Road in Cape Coral. "He started running around with her some," says Debbie. "And I can't remember her name. And I don't know if anybody ever talked to her," she says. They also wonder how Josh, who had just recently moved to Southwest Florida from Indiana, would have found his way to that apartment complex on Royal Palm Avenue in Fort Myers. "Maybe somebody out there on the island knew somebody who lived in those apartments," says Debbie referring to the island resort where Josh worked. "Somebody had to know something," she says. And she has a message for anyone who might know anything about the killer. "Don't be the coward for that coward, and not come forward," she says. "If he's killed my son, how many others has he killed and got away with?" adds Debbie. "This is still an active and open investigation," writes Sgt. Rodriguez who adds the police have come close to moving forward with the case in the past. "We did present a potential suspect to the State Attorney's Office, but there was insufficient evidence to proceed," writes Sgt. Rodriguez. Rodriguez writes," We ask anyone with information to contact the Fort Myers Police Department or Crime Stoppers . Debbie echoes that call for help from witnesses. "I beg you to come forward," she says. "If you know something, you need to do the right thing. All you have to is call Crime Stoppers," she says. "You don't even have to tell them who you are." The number for Crime Stoppers is (800) 780-TIPS. Debbie can only hope an arrest in the case will give her some small sense of comfort after a painful 12 years of emotional suffering. "I'm not going to sit here and lie," says Debbie. "I have depression issues. I have anxiety issues. I have trouble sleeping." "You don't get over it," she says. "You just learn to live with it...this way without your child."